Call us now on 0800 242 5559 for more details or request a catalogue by filling in the form on the right hand side of this page. 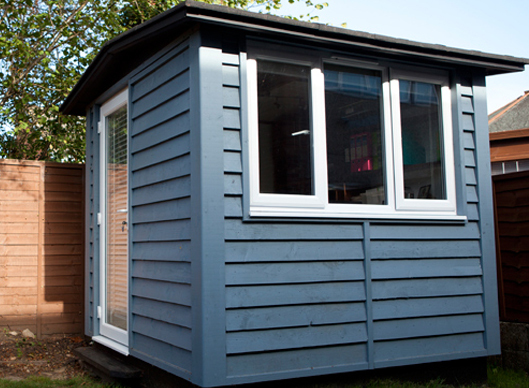 Our Quinto Suffolk Barn is our grandest Smart Garden Office, it’s the largest in the range but we haven’t once compromised with style or construction. 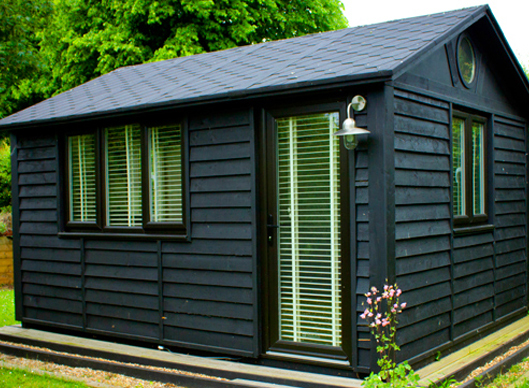 With substantial dimensions of 21 ft x 10’6 ft the Quinto Suffolk barn will accommodate the most demanding of owners. Whether it’s as an office for up to five people or as a family room the Quinto really does offer the most comfortable delightful space. 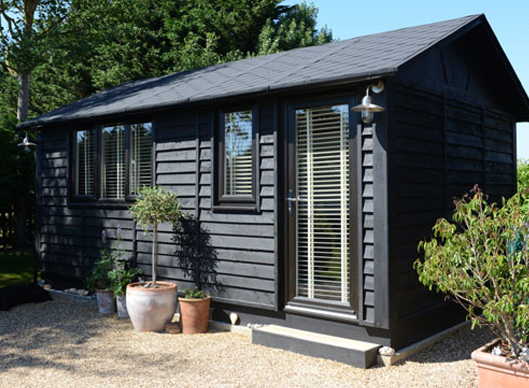 The spacious Quinto Suffolk barn measures internally, a truly impressive space with a large scope to create your dream room whether it’s a garden room, art studio, home office or playroom. 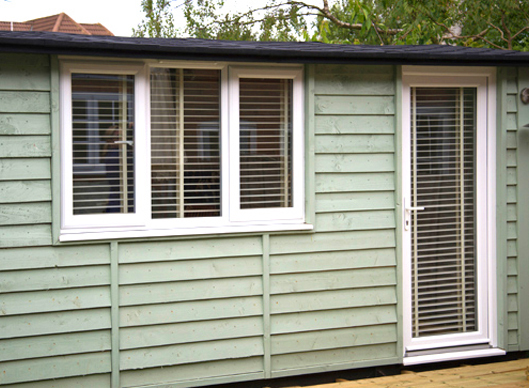 The configurations of the double glazed windows and doors are fully adaptable and are moved to suit its new setting. 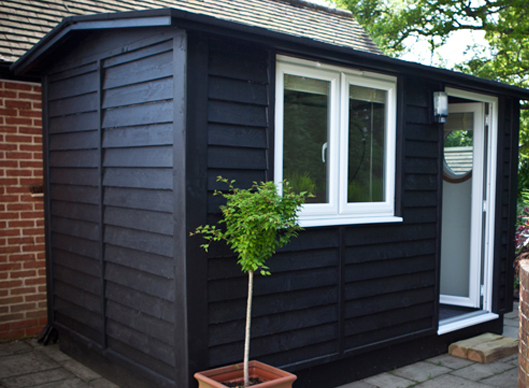 Fitted with electrics, carpet and lighting, the Quinto Suffolk barn has everything you need to make it an enviable garden feature. 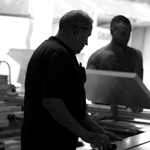 We love the size of the Quinto because it allows us to create the ultimate family space. Beautifully rustic and stunningly charming with at traditional weatherboard finish, the Quinto Suffolk barn exterior design fits perfectly into any backdrop. 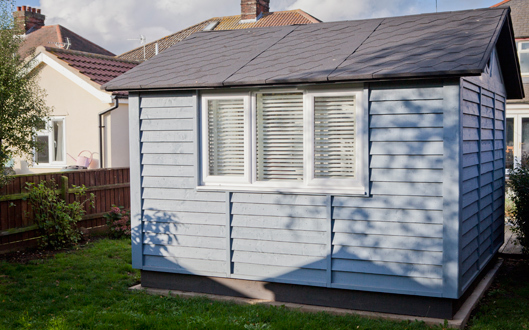 Using our trusted and incomparable TuSC technique it’s built to last. The Versadesk:The horseshoe and double boomerang versions of our renowned Versadesk will look stunning in the Quinto Suffolk Barn. 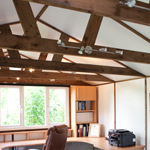 The interior of the Suffolk Barn Quinto is truly impressive, with a beautiful design, soft edges, beautiful wooden rafters and the charming rustic exterior, the Quinto is the definition of the perfect Garden office, art room or retreat, the uses are endless and so are the configurations. 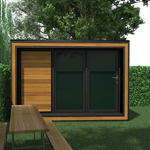 Here at Smart it’s important to us that you have a Smart Garden Office you’re proud of, and we love the fact you can create one that’s truly unique to you. From the exterior color to the interior design it’s all about your preferences. 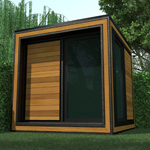 Plus with our Smart Garden Office furniture you can create a truly unique interior as it’s all handmade and built by us. The book nook works perfectly in the Quinto, with a window seat, encased in book shelves you can surround yourself with your favourite books, and read them in peace. We create the components to your Smart Quinto in our UK factory and then our installation team takes just 3-4 days to complete installation. 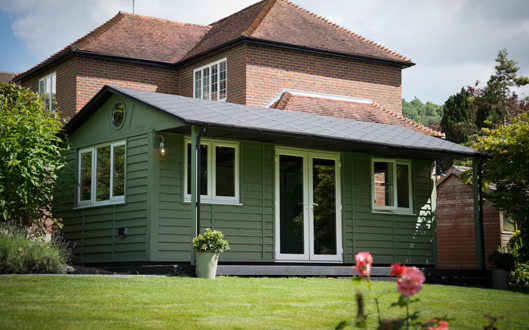 If the Suffolk Barn isn’t quite what you’re looking for, then our Ultra range offers a completely different style. The Ultra Solo is the perfect one person office, with room to spare!